NAIROBI, Kenya — Seven Kenyan doctors who are officials of the medics union were jailed Monday for failing to call off a two-month strike by doctors at public hospitals that has seen several die due to lack of medical care. Judge Hellen Wasilwa said she could not delay further the contempt of court sentence she had suspended earlier on condition the doctors call off their strike. At least 5,000 doctors are on strike for better pay and to protest the dilapidated state of Kenya's public health care. "This court declines to review its order sentencing the applicants to one month jail term ... you can now start serving your sentences, those are the orders of the court," Wasilwa said. 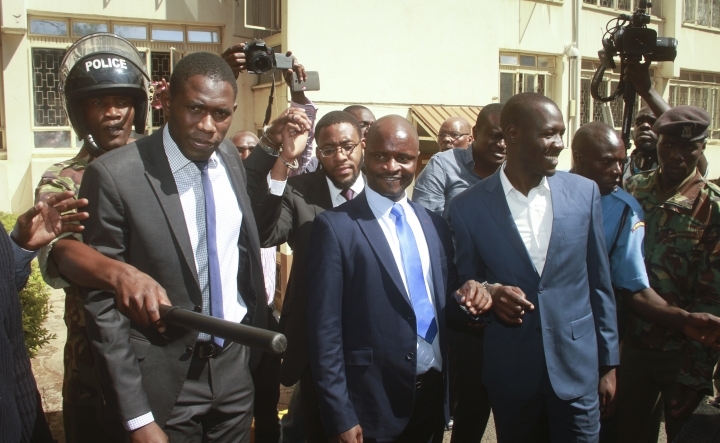 The Kenyan Medical Practitioners, Pharmacists and Dentists Union said it has called off all communications with President Uhuru Kenyatta's government until their officials are released. "There will be no negotiations as long as the union officials are in jail ... Jailing them is actually stalling the negotiations to end the strike. It is not a solution," said Thuranira Kaugiria, a top union official. Kenyan paramilitary police were later deployed to disperse hundreds of doctors holding a peaceful vigil in support of their colleagues that was being covered live on TV. Doctors want the government to implement pay raises agreed upon in 2013. That agreement would raise their salaries by 180 percent. Currently doctors earn an average basic salary of $400 to $850 per month compared to a Kenya legislator who earns nearly $14,000 a month. 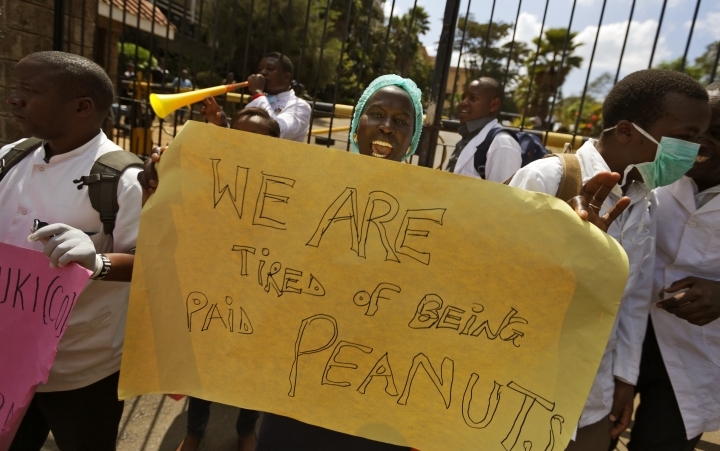 The strike has caused a near-total paralysis in the Kenya's public health sector and many are believed to have died from a lack of emergency services. Early in December, President Kenyatta said at least 20 people had died as a result of the strike. Kenyatta has twice asked the doctors to return to work, first appealing to their humanity for the suffering masses and then offering a partial increase of the salary hikes agreed upon in 2013. The doctors' union rejected both offers and urged the government to pay the full salary increases promised three years ago. 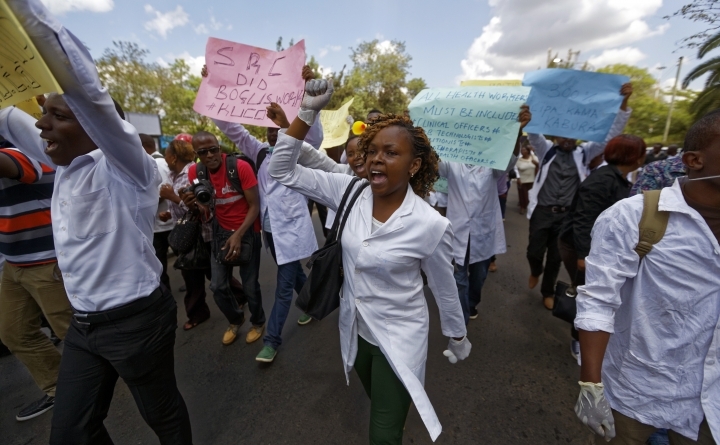 In 2012, Kenya's doctors went on strike to protest the bad state of public health care. Emergency rooms in some of Kenya's public hospitals frequently don't have gloves or medicine, and power outages sometimes force doctors to use their cell phones to provide adequate light for a surgical procedure. Kenyatta has said his government must cut down on a ballooning wage bill which he says is not sustainable. Respected anti-corruption crusaders have said the problem is not the wage bill but corruption. Several large-scale corruption scandals exposed recently — including one at the health ministry where government auditors questioned the diversion of $46 million — have brought many Kenyans to question the president's commitment to ending graft. Leading economist David Ndii argues that Kenyatta's regime is the most corrupt of the all of the four presidents Kenya has had. In an opinion piece in Kenya's largest circulation newspaper, The Nation, in December, Ndii argued the reason the government does not want to increase salaries is because officials want to "create more headroom for looting." John Githongo, a former Kenyan government adviser who exposed millions of dollars in government corruption in the previous regime, makes similar allegations. "This is the most corrupt government we have in history," said Githongo, charging that the government has the resources to pay doctors, but officials are diverting the funds. "Here we have entire government projects that are designed from the onset to steal," Githongo said. "We no longer have corruption in Kenya, we have theft and plunder." Kenya has fallen six places to be ranked 145 out of 167 countries in an index by Transparency International for 2016.